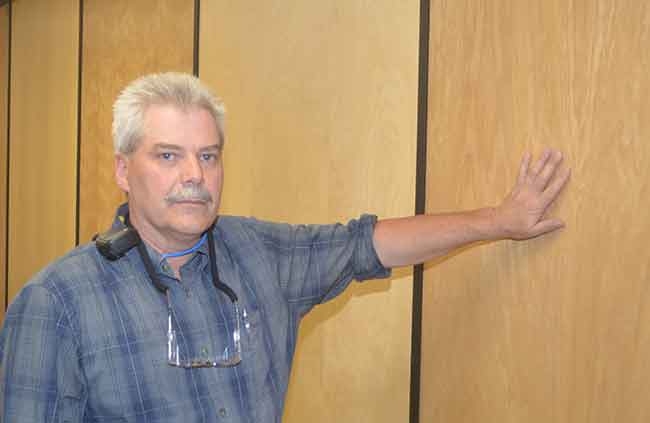 Aug. 11, 2016 - With the recent closing of manufacturing plants in the North Bay, Ont., area, one can assume that most people living in the region were relieved to witness the reopening of Columbia Forest Product’s hardwood veneer plant in Rutherglen, Ont. The plant was reopened this past April with USD$1.5 million invested into the facility. Before being shut down in 2010 during the latest economic downturn, the plant had operated without closures since it was built in 1972. “In its heyday, there were 320 people employed here,” says Peter Loy, plant manager for Columbia’s Rutherglen plant, during a tour of the facility. A reliable and secure log supply is critical for the long-term sustainability of the Rutherglen plant. Well-managed, certified Crown forests are the main sources of veneer logs for the mill, and the company is working with government on securing long-term supplies. Currently the plant purchases white birch, yellow birch, maple and red oak. The operation, which uses board feet for measuring its log consumption, currently processes 50,000 bdft. of logs per week. All of the logs are transported in by truck with the option of rail a possibility for the future. The tags are then entered into the plant’s inventory system. The tags show where each log was purchased, the dollar amount paid for the log, species type and where they were cut. Two John Deere wheel loaders transport the logs from the inventory yard over to the plant’s heated conditioning vats for a steam and hot water treatment. Depending on species, the logs sit in the vats for anywhere from 30 to 100 hours. Red oak typically takes the longest to prepare for the peeling process. The logs need to be heated to somewhere between 125F and 140F to be ready to be sent to the lathe line for peeling. After reaching the necessary temperature, the logs are dropped onto an infeed deck and sent through metal detectors before moving through a line where the log tag information is scanned, the stained ends are cut off and the logs are debarked. The logs then move onto a COE (USNR) lathe line equipped with McDiarmid Controls. The lathe line went through an extensive rebuild to prepare for the re-opening of the plant. The lathe peels the logs 0.024” thick. The veneer from the peeled logs is rolled up then sent to the first clipper. “Because the lathe line runs faster than we can dry it, we roll it up,” Loy explains. The rolled up veneer moves across a carriage system and then passes through a Merritt defect clipper that clips out 4’ by 8’ ribbons. Any narrower components left over are shipped to a splicing line at another one of Columbia’s plants where they are reassembled to create additional 4’ by 8’ panels. After passing through the clipper, the peeled logs are sent through a 2005 Grenzebach BSH dryer where they pass through the dryer between two screens. The dryer is a steam heated, press dryer. The wood is dried for two minutes then sent to the cooler and comes out as dry veneer. “It is cut on the same spot on the logs so the characteristics line up about half-an-inch thick,” Loy says. 4’ x 8’ veneer are sent down a separate line where they are transported over to a palletizing line. The full pieces are then either shipped over to one of Columbia’s plywood plants in Canada or the U.S. or to a third-party plywood plant. 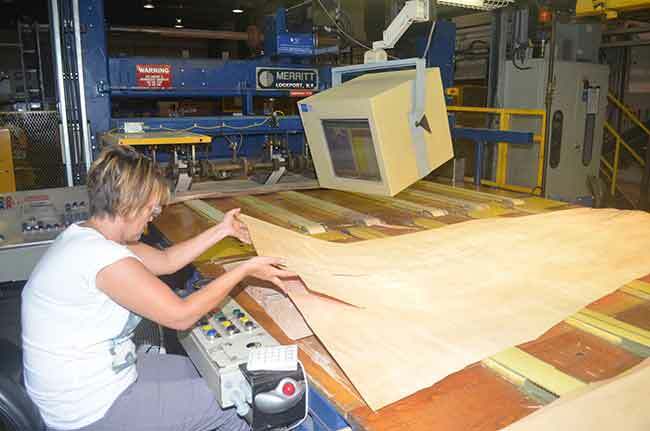 Approximately 65 per cent of the veneer is shipped to one of the Columbia plywood plants. Smaller pieces are graded, separated by grade and piled on pallets to be shipped to Columbia’s other veneer plants in Canada and the U.S. where a splicing department will re-assemble the smaller pieces of veneer back together into 4’ x 8’ panels. About 95 per cent of the finished product ends up finding a home in the U.S. marketplace. Columbia has also found a home for all of the residuals left over from its veneer operation in Rutherglen. The cut-off log pieces end up being turned into firewood or are fed into the plant’s boiler, while all the other residuals from the operation are burned in the boiler used for heating the plant, cooking logs, and heating the dryer. The plant currently employs 52 employees on a single shift with plans for that to increase in 2017, when the company plans on expanding its production at the 120,000 sq. ft. facility to include a splicing department for reassembling the smaller pieces of veneer produced in-house. These additional jobs will not add up to the previous 320 positions once held at the plant, but the surrounding community, which has struggled with finding good paying, and stable full-time employment, will definitely appreciate them.